This town was formed from Olean, April 15, 1818. Burton (now Allegany) was taken off April 18, 1831, and Carrolton, March 9, 1842. It is an interior town, lying a little southeast of the centre of the county, and contains 33,715 acres The surface is a mountainous and hilly upland, the highest summit, near the southwest corner, being 1,300 feet above the river. The Allegany river runs through the southwest corner of the town, and the Allegany Indian Reservation, lying on both sides of the river, is here over a mile wide. The name of the town is derived from the broad valley of the principal stream running through the town from the north, and uniting with the river at Kill Buck. The town of Great Valley, by its present limits, is composed of township 3 and the north half of township 2, in the sixth range of Joseph Ellicott's survey, and is bounded north by Ellicottville, east by Humphrey and Allegany, south by Carrolton, and west by Salamanca and Little Valley. The soil upon the high upland is a hard clay mixed with disintegrated slate and shale. In the valleys it is a gravelly loam. The primitive forest consisted of a heavy growth of beech, maple, hemlock, and other trees common to this latitude; and last, but not least, those were largely interspersed with numerous stately pines. The conversion of this latter choice timber into lumber, for the markets down the river, constituted the leading occupation of the early settlers of Great Valley. About a dozen water-power sawmills were built in town by them to manufacture pine lumber, and almost incalculable quantities of that commodity wee manufactured by them and run down the Allegany, Ohio and Mississippi Rivers. The lumber was used for building and other purposes in the cities and towns along those rivers, except portions of it, which were shipped to the West Indies and other foreign markets, and up the various rivers of the West and Southwest. But that busy period of lumber-making, which made Great Valley some fifty years emphatically a lumber region, has now nearly terminated, by reason of the exhaustion of the supply of pine timber; and the occupation of the people has greatly changed, from the lumbering business to the less exciting but more reliable occupation of farming, stock-raising, and dairying. Although a large portion of the land is still set down by the assessors as "non-resident," and is yet in a wild state, there are many good farms under cultivation, mostly, however, in the valleys. James GREEN is credited with being the first permanent settler of Great Valley. He came from New Hampshire, and located first at Olean Point, but removed thence to near the mouth of Great Valley Creek, in 1812, being the first white inhabitant to locate on the Allegany below Olean. He afterwards removed down the river, and died at Golconda on the Ohio River. His brothers, Francis and Richard, came a little later, and settled near the mouth of Wright's Creek. They were men of respectability and good judgement, and engaged in mill-building and lumbering. Ira Norton came to Franklinville in 1807, and in 1816 located near Peth, on the farm now occupied by his son, Andrus L. NORTON. Jeremy WOOSTER settled on the place where Orrin PITCHER had made a beginning in 1815. This was the place now owned and occupied by E.H. HESS. Benjamin CHAMBERLAIN came from Little Valley in 1816, and built a mill and resided for some time on Lot 9, about a mile above the mouth of Great Valley Creek. He moved to Peth a year or two later and built a house and a store, and bought a grist-and sawmill of J. And L. WOOSTER, on the west side fo the creek. He either owned, or had an interest in, several mills and stores, and became the owner of a large amount of landed property. The father of Judge CHAMBERLAIN and four or five brothers also settled in town. Their names were john, David, Simon, and William. The last named is still living on Wright's Creek. Gen. Calvin T. CHAMBERLAIN of Cuba, was also a brother of the Judge. He died in 1878. Jeremy, Henry, and Lewis WOOSTER came with the pioneers of 1816. David GREGORY, John ALEXANDER, Daniel FARRINGTON. Col. William BAKER was an early settler at the mouth of Great Valley Creek, where he built a house and kept an inn on the east side of the creek. A part of the house is still standing, it being now over sixty years old, and is occupied as a dwelling. It is owned by J.H. MELHUISH. That tavern was a much-frequented stopping place in pioneer times, especially for raftsmen. Marcus LEONARD kept an inn on the west side of the creek, beginning a few years later than Col. Baker. David FARNHAM, who was an early pioneer, settled near Peth about 1816. He died in 1878 at the age of eighty-five years. Among other early settlers in town were Arza SEARL, David SIMMONS, John SAWYER, Truman and Erasmus D. KELSEY, D. MARKHAM, Chas. WARD, F. BRYANT, John ELLIS, Isaac LAWTON, J. MUDGETT, Elmore SEARS, John ALEXANDER, N. and M. CHASE, J. and R. CHASE, Benjamin B. BACON, William BARKER, Robert PATTERSON, Parley CARVER, G.W. DRAKE, N. BONESTEEL, N.L. and M. GIBSON, and Michael HICKEY. The father of Benjamin CHAMBERLAIN was called Benjamin CHAMBERS. This was because, as a soldier of the Revolution, he served under the name of CHAMBERS. He was a pensioner until his death in 1855, aged ninety-four years. Other early settlers were Nicholas FLINT, Daniel MC KAY, B. HIBBARD, Moses CHASE, Reuben and Robert CHASE; and many of those early settlers had sons, who also soon took an active part in the business affairs of the town. Among men of distinction, who in their early days were residents of Great Valley and who are still living, are Hon. Chauncey J. FOX of Ellicottville; Hon. Alonzo HAWLEY of Hinsdale, whose first wife was the only child of Judge CHAMBERLAIN; Hon. Nelson I. NORTON, of Hinsdale, member of Congress; Hon. Wesley FLINT of Washington, D.C., late consul to China; and Hon. A.A. GREGORY, now of Michigan, formerly a member of Assembly, and for many years sheriff of Cattaraugus County. On the early settlement of Great Valley, there existed an Indian town or settlement in the midst of which was the wigwam of KILL BUCK, their chief, which stood on the site of the present store of J.M. BEMIS & Co. The names by which some of the Indians were known were John LOGAN, John HALFWHITE, David SNOW, Jonathan TITUS, William HALFTOWN, Daniel HALFTOWN, William JOHNSON, John HUTCHINSON, Daniel KILL BUCK, and several others. These Indians subsisted by hunting, fishing, and a small annual annuity which they received from Government. They, like most of their tribe, were indolent, fond of whisky, and mostly poor. Their sons are not much inclined to adopt the agricultural pursuits of the white people. They derived a considerable income from lands rented to white people. They have a council house at "Horseshoe Bend", on the river, about 2 miles above Kill Buck. Here they meet several times in each year to worship the "Great Spirit" in their Pagan way, and for dances and other singular ceremonies peculiar to Indians. Jonathan TITUS is still living, and in good health, at the age of eighty-eight years, and says he is going to reach one hundred. He certainly bids fair to become at least a centenarian. The sound of the engine and the rush of the white men who came to the new town to erect buildings and carry on business soon induced the Indians to lease their lands to the newcomers and retire a little farther back. The first birth in town was that of Ira GREEN, in 1813. The first death was that of Mrs. HIBBARD the same year. The first school was taught at the house of James GREEN, by Joel FAIRBANKS, in the winter of 1817. A school was kept a year or two later in a small plank house, near the present residence of H.D. DIDCOCK, by Daniel CHANDLER, who afterwards was a somewhat prominent citizen of Hinsdale. There were only a few children to attend the school. The first marriage in town, it is now supposed, was at the Double Mill in 1818, of Matthew GIBSON to Esther MARKHAM. Among the early marriages in town were Nathan HOWE, Jr., to Nancy MUDGETT, and John GREEN to Lucy HOWE. The last-named lady is still living at Kill Buck, a widow, John GREEN having died March 31, 1874 at the age of seventy-five years. James GREEN kept the first inn in 1813 near the mouth of Great Valley Creek. Lewis WOOSTER kept the first store which was located at Peth in 1815. The first doctor was Dr. TROWBRIDGE, who located at Kill Buck. He was at first without means, and went on foot to see his patients; but being a pretty good physician, he succeeded in doing a fair business for several years. But, for the most part, doctors as well as lawyers, when needed, were obtained from Ellicottville, or some other adjacent town. At one of the early meetings, John GREEN attended and being rather roughly dressed in lumberman style with a blanket coast, the preacher mistook him for one fo the aborigines, and in his prayer thanked the Lord that the heathen had turned out to hear the word. A story is related of a thievish fellow who came to Kill Buck in those early days, and learning that John GREEN had considerable amounts of money and commonly kept it in a trunk, he slyly crept around and stole trunk and all. But he got only about $30 as John had just paid out most of his money for land. A lot of men took the thief in a canoe out on the river at night, and ducked him in the water several times. The next morning he told Mrs. PATTERSON of his troubles, and the rough handling he got; and said he, "I was three times in eternity last night." It is related that a traveling preacher came along to Kill Buck, and made inquiry for a deacon or leading professor, probably with a view of finding an acceptable place to stay overnight. Some waggish person sent him to Otis HOWE, and he, in turn, told him it was a mistake in sending him there but told him that he presumed Deacon PEMBERTON, rather a rough but good pilot, was the man, and directed him to the place were the deacon was at work. The priest found him and tried to make known that he was looking for a good brother in the church, but PEMBERTON was quite deaf and did not get his meaning. Again the preacher repeated, "This is Deacon PEMBERTON, I suppose?" PEMBERTON turned and looking earnestly at him, said, "I don't hear you. Speak a little louder; I'm as deaf as a d--------d adder." The preacher began to think he had fallen upon a streak of bad luck and rough deacons; but a little further inquiry convinced him that there were plenty of hospitable people at Great Valley, with whom any civil person could find entertainment. During the period in which the various sawmills on Great Valley Creek were in active operation, the lumber made at the mills, as far up as the Lawton mill, was piled on the bank until rafting time, which was usually about the month of March, when it was rafted into the creek awaiting the spring flood when the rafts were run down the creek to the river. The creek rafts consisted of one string of four to five platforms or lengths. At the river, about four of these strings were put into a Warren raft. When run to Warren, three of those fleets were put together to make up a Pittsburgh fleet, being three abreast and twenty platforms in length. On the Ohio, from Pittsburgh, the usual raft or fleet was from three to five platforms abreast, and from twenty to forty platforms in length. On a creek raft, from three to five hands were employed. On a Warren raft, from seven to ten hands, including the pilot; and on the Ohio, from a dozen to twenty men. A creek platform commonly contained from 16,000 to 20,000 feet, and a river platform, 25,000 feet. Large quantities of shingles were often carried to market on the rafts. Many of the rafts had cabins or shanties on them, some of which were made quite comfortable and well furnished, even to nice carpets on the floors. In early times it was customary for raftsmen to travel home from Pittsburgh on foot. Oarsmen were paid $4 to $7 per trip to Warren, $20 to $30 to Pittsburgh, and $30 to $40 to Cincinnati. Pilots were paid twice as much or more. A full size Ohio raft is 80 feet in width, and 640 feet in length, and contains about from 1,000,000 to 2,000,000 feet of lumber. There are, however, seldom as large as that. The mills built by the early settlers on Great Valley Creek for the manufacture of pine lumber averaged about one for each mile from the mouth of the creek to the Ellicottville line. The first, at Kill Buck, near the mouth of the creek was built by James GREEN, and afterwards owned and run by Captain HOWE. This was built about 1812. The second, the Wooster Mill, built by B. CHAMBERLAIN near the present residence of H.D. DIDCOCK, in about 1816. The third was at the bend, two miles from the river and was built by David GREGORY and SAWYER. There was also a grist mill built by them, and they owned a store at that point. The mills were destroyed by fire soon after, and were not rebuilt. This was built about 1814. Fourth, the Double Mills, built by Col. BAKER and Judge CHAMBERLAIN, stood a few rods above the present railroad bridge. A large amount of lumber was manufactured by them for years. Fifth, the grist and sawmill at Peth, built by Jeremy and Lewis WOOSTER in 1815, and sold to Judge CHAMBERLAIN on the west side of the creek. Later, DUNN and MORTON built a sawmill on the east side of the stream and used the water from the same dam. Sixth, the sawmill built by Isaac Lawton, five miles below Ellicottville, near the Plank Road House, about 1818. Seventh, a mill about two miles above Lawton's, built several years later (about 1837), by J.W. STAUNTON and since known as the Williams Mill. Eighth, the grist and sawmill built about 1816 by James GREEN, and afterwards sold to Rev. John ELLIS. They stood about two miles south of Ellicottvile. Ninth, a sawmill on the east side of the creek, just below the town line, built some years later than the Ellis Mill, by COLBY, CHAMBERLAIN and BROTHERS. On Wright's Creek, Judge Francis GREEN built a sawmill about 1836. About 1820, Richard WRIGHT built a sawmill on the stream which takes its name from him and after using the same for four or five years, he sold out to David CHAMBERLAIN, who after residing there twenty years, sold his establishment to William J. NELSON, who occupied the same until his death, in 1862. The Willoughby sawmill, on Lot 11, was built some years later than the last named, and for some years past there has been a steam sawmill in operation, about a quarter of a mile below the site of Willoughby's; but both, like most of the sawmills in town, have disappeared within the last few years. There was a sawmill in Sugartown Creek built by D. HUNTLEY in about 1835, and afterwards owned by W. and R. WRIGHT. It was rebuilt by Rev. Mr. MC KOON, and is now owned by his son N. C. MC KOON, and is still used. It is near the line of Humphrey. Morgan THORP built a sawmill on Windfall Creek, about a mile north of the river in 1850. It is still in use when the supply of water is sufficient. The first steam sawmill on the riverbank at Kill Buck was built by C. BURNSIDE and Co. in 1850. The building was 36 by 80 feet and two stories high, and gave employment to twenty hands. They manufactured 20,000 feet of lumber daily. The establishment was sold to BEMIS & Company in 1863. It was burned in 1878. A new steam mill has been erected by BEMIS and Company a few rods above the old site, which is 100 by 50 feet and two stories high. About the same number of hands are employed as in the old mill. Improved circular saws and greatly improved machinery are now used, by the help of which the saw logs are converted into lumber in much less time than was required by the old process of manufacturing lumber. At an early period roads were laid out through the wilderness. The old stage road from Buffalo to Olean passed through the town. At first, it passed down the Great Valley Creek to Peth, where the post office was kept; thence up the valley of Wright's Creek to Chapellsburg. The road was first marked out and the underbrush and logs cleared away, so that teams (oxen and sleds) could pass, and afterwards the trees were cut away, the rough places graded, and bridges built. A large amount of labor was required to make the road passable for the stages. That road was a great convenience to the early settlers. Judge Ira NORTON, and his brother-in-law, Samuel L. HOLLISTER, and two other men, were seven days at work in getting from Franklinville to Great Valley by the way of Sugartown. The distance is about fifteen miles. This was in the year 1816. There was a road, at an early day, leading along the north bank of the river to Great Valley and so down to Warren, PA., but it was extremely rough, and used mostly by footmen and lumbermen returning from their trips down the river with rafts. There was a road built under authority of an act of the Legislature, passed in 1841, and running on the north side of the river also, through the Reservation. This was a much-needed improvement. It was cut out through the woods, three rods wide and graded and bridges built. On the completion of the Erie Railroad in 1852, a plank road was constructed from the river to Ellicottville, a distance of ten miles. This was much used for some years, but was finally discontinued, ans it scarcely paid the expense of gatetenders and keeping in repair. About four miles of the Erie Railroad and nine miles of the Rochester and State Line Railroad pass through the town of Great Valley. The Erie station, at the mouth of the creek, is called Great Valley, and the station on the Rochester and State Line Road, five miles north, has same name. No records of the town meetings prior to 1841 are to be found in the town clerk's office, the old book of town records having been lost or destroyed. Henry WOOSTER is believed to have been the first supervisor in 1819, when the town comprised Great Valley, Carrolton, Allegany, and Humphrey. Other early supervisors were Francis GREEN, Richard WRIGHT, B. CHAMBERLAIN, Charles WARD, and Seth COLE. Among those who held the office of justice of the peace in town previous to 1841 were Daniel FARRINGTON, Richard WRIGHT, Stephen S. COLE, Ira NORTON, Daniel HOWE, Francis GREEN, B. CHAMBERLAIN, and John MUDGETT. In 1830, Benjamin CHAMBERLAIN was postmaster at Peth. After him, in 1833, Francis GREEN was postmaster. The accrued postage amounted to $22.82. The next postmaster was Ira NORTON in 1842, and for several years, and Andrus L. NORTON was the next postmaster. In 1870, Frederick CRAMER was postmaster, and soon after the post office was changed from Peth to the Plank Road House, and M.W. HICKS appointed postmaster. In 1876, measures were taken to re-establish a post office at Peth. It was to be called Great Valley Centre. George E. HOWLAND was appointed postmaster, but the project failed to be carried out. A post office was at Kill Buck about 1836. Marcus LEONARD was postmaster in 1840 o the west side of the creek. After him, William CROSS was appointed and held the office several years. About that time the office was removed to the east side of the creek where it has continued to be kept. George J. WITHERELL was postmaster, and after him Walter E. PHELPS held the office for several years. D.H. PATTERSON is the present postmaster. Charles T. JENKS is deputy and has charge of the office. From the earliest settlement, the establishment and maintenance of schools for the instruction of their children has been an object of foremost importance with the people in every locality in town. The first school houses built in the wilderness were, of course, rough and rude, but made as comfortable as possible with the limited means which they possessed. Men were hired as teachers at from eight to twelve dollars per month, and women at from six to ten shillings per week. The teachers usually "boarded around" the districts among the patrons. There are now good frame school houses in each of the seven school districts in town. In District No. 1 at Kill Buck, there is a large two-story school house, well furnished for the use of primary and more advanced scholars, and usually good teachers have been employed. There has been for many years a good school maintained in District No. 2 at Peth. In District No. 3 at Great Valley Centre, there is a good school house. Also in No. 4 on the Sugartown, there is a good and well-built house. In No. 5 on Wright's Creek, there is another suitable house. In District No. 6 adjoining Little Valley, the school house, which is also a good one, is about a mile west from Peth. In District No. 7 adjoining Ellicottville, a good school house was built at an early day, and has been rebuilt within a few years. There is an Indian school house at Horse Shoe Bend on the Reservation for the instruction of the Indian children, and also those of white people living in the vicinity, in the rudiments of an English education. The school statistics of the town for 1878 are obtained from Sanford B. MC CLURE. The town has 9 school districts, containing 9 school houses which with sites, are valued at $3,885, having 425 volumes in library, valued at $288. The number of teachers employed is 10, to whom was paid $1,921.15. The number of weeks taught was 264 3/5. The number of children of school age is 619. Average daily attendance is 1,233 74/1000. Amount of public money received from State is $1,240.65; amount of money received from taxes is $727.14. There is a small village at Great Valley Station on the Erie Railroad, two miles east of Salamanca. It contains a store, tavern, wagon and blacksmith shop, steam sawmill, grocery, and a saloon, besides the depot and several dwellings. At the corners, half a mile north of the depot is another collection of buildings, called Kill Buck. This place contains a store, hotel, meat market, wagon and blacksmith shop, Methodist Episcopal church, a post office, and a large two-story school house and about 20 dwellings. On the opposite side of the creek and a few rods west from the post office, are several dwellings, a Catholic church, a brewery, cooper shop and a hotel or saloon. At the Plank Road or Halfway House, as it is commonly called, there are two stores, a hotel, Great Valley post office, a steam sawmill, a blacksmith shop, and several dwellings; and on the west side of the creek opposite is the new railroad station, a school house, cheese factory, and a few dwelling houses. A depot building is soon to be erected. The small village of Peth is situated on the Great Valley Creek, three miles from the river. It has a tavern, a grocery store, school house, blacksmith shop, a shingle mill, and several dwelling houses. The handle factory was burned September, 1878. At an early period after the first settlement of Great Valley, the village of Peth was an important point, being the central business place for a large lumber district for a period of about forty years. Here centered the business operations of the WOOSTERS, the GREENS, the CHAMBERLAINS, the GIBSONS, the HOWES, the KELSEYS, the MARKHAMS, and other active early settlers and their sons. About 1845, a dozen or more Scotch families settled at Peth and its vicinity. James NELSON owns and occupies the farm and large dwelling house formerly occupied by Judge CHAMBERLAIN. With the decline of the lumber business some of the settlers left, and the population of Peth also declined. The first store kept at Kill Buck was by Daniel and Horace HOWE on the west side of the creek in 1834. It was afterwards kept by Marcus LEONARD, who also kept an inn at that point for some years. He died of the cholera, at Buffalo in 1850. Hiram SMITH, from Chautaugua County, was the next proprietor of said store for a year or two and he was succeeded by CROSS and ELLSWORTH, about 1846. They continued in the business for some years. In 1857, Andrew MERKT bought the store, including the tavern in the same building, and carried on the business of brewing lager beer and hotel-keeping for some years. After his death in 1860, Lewis P. BREWER was proprietor of the brewery and hotel. There was no store kept on the west side of the creek after about 1855. The brewery and hotel was burned about 1865. It was rebuilt by John SPRAKER in 1874, and bought by Lewis TORGE, Jr., in 1875. He makes beer for the wholesale trade and does no retail business. In 1852, James W. PHELPS built a large two-story store on the northwest corner of the streets at Kill Buck. He kept a good stock of merchandise and traded at that stand for about twenty years. Mr. Phelps still owns the store, which is occupied by George J. WITHERELL as a general variety store. Two stores on the east side of the street nearly opposite the Phelps store, were built about the same time-one by Jeremiah FRANK, who kept a liquor store, and the other was built by R. PATTERSON and Son, in which the post office is kept. In 1856, Oscar SENEAR and Francis GREEN, Jr., built a store on the river bank opposite the depot on the same spot where formerly stood the wigwam of Kill Buck, the Indian chief. This store was afterwards occupied by Charles BURNSIDE for some years, and then for a few years by Henry S. SHORTER, with a fair stock of goods. Michael SHEEHAN occupies the store east of the depot, built by Jos. COLMAN and occupied by H.S. SHORTER and Company, in 1861. J.H. MELHUISH owns and occupies the Railroad House, next north of the depot. At Peth, Lewis WOOSTER was the first storekeeper. He sold the store to Judge CHAMBERLAIN in 1821. It was kept by the Judge for many years, with a large stock of merchandise. William J. NELSON kept store there in 1848, and for several years. There was a chair factory started in the steam sawmill of H.S. SHORTER and Brothers in 1869, and carried on by Rev. John R. ALEXANDER for a year or two. From four to six hands were employed, and a large quantity of various kinds of chairs were manufactured. A large number of the first settlers of Great Valley came from the New England States, noted for its schools and churches. Very soon after the first settlers located, religious meetings were held. They met for worship in private houses, in barns, and sometimes in the woods, until school houses were built, and then the meetings were very commonly held on Sundays in those temples of early instruction. Several persons of the Presbyterian faith residing near Peth, united in holding meetings at the house of Ira NORTON, until a school house was built. Of those who thus united for worship, were Deacon Josiah HOLLISTER and his son, Samuel L. HOLLISTER, Ira NORTON and Jesse HOTCHKISS and their wives. The Rev. 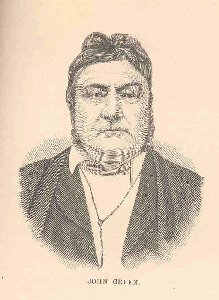 Mr. SPENCER, from Fredonia, was present at the organization, and he preached occasionally to the church at Great Valley till about the year 1825. The Rev. Mr. WILLOUGHBY sometimes preached to the congregation and he was hired for a year; and several other ministers labored there from time to time until about 1835 when the Presbyterians united with the Methodists to hold meetings. For a time, Revs. NEVINS and MAY preached to the congregation, and the Rev. Sylvester COWLES then residing at Ellicottville, occasionally. But the small church at Peth has been weakened by changes, removals, and deaths, until now, 1878, the only survivor of the little band who united as above mentioned is Mrs. Sybil HOLLISTER, widow of Samuel L. HOLLISTER, residing at Mansfield in this county. On the 4th day of November 1831, a Baptist Church was organized in Great Valley by a meeting held for the purpose at the house of Charles WARD. Ira BURLINGAME was moderator and J.A. BULLARD, clerk. The following-named persons, on presenting their certificates of good standing, were duly received and organized as members of said church, viz. : John ELLIS, Charles WARD, Jos. A. BULLARD, William MARKHAM, Lydia WARD, Rachel MARKHAM, Lucy PERKINS, and Julia PARMELEE. Elder Samuel BRAYMAN addressed the new church and gave the right hand of fellowship, and Elder Ebenezer VINING closed by prayer. Religious services were from that time frequently held at the school house in District No. 2, and the following additional members were soon after added, viz. : Ira SMITH, Alvah KEYES, Freeman BRYANT, Gershom R. STAUNTON, Benjamin LEE, Jane SMITH, Jerusha HENRY, Emily MARKHAM, Ruby Ann MARKHAM, Rachel Ann PHILLIPS, Lucinda SMITH, Martha LAWTON, Elizabeth MARKHAM, Rhoda PHILLIPS, Polly CHAMBERLAIN, Amanda PARMELEE, Mary Ann MC NAUGHTON, and Mary FISH. The pastors of this church were S. BRAYMAN, E. VINING, E. GOING, J. ELLIS, Daniel PLATT, and Records VINING. Of late years, the Baptists have kept up a church organization in the vicinity of the Plank Road House, and during the winter of 1877-78, they had a series of revival meetings at the school house, and there were a considerable number who were converted and united with the church. The Rev. Mr. PIERCE was the principal preacher. They have a Sunday school of about 30 children; M.W. HICKS is the superintendent. In the neighborhood along Wright's Creek, the United Brethren first held meetings about ten years ago and they also had revival meetings at the school house near John Wright'S and gained a large number of converts. Rev. BRUNERHOFF was the first preacher, and afterwards Revs. BARBER and GAGE were the pastors. They have a Sunday school; James HARRIS is the superintendent. Among others who embraced religion and became converts to the faith was Judge CHAMBERLAIN, who was converted and united with the Episcopal Methodists in or about 1845. He afterwards gave liberally of his ample fortune for the endowment of the Wesleyan College at Meadville, PA., and also for the establishment of the Chamberlain Institute, at Randolph, N.Y.
A Methodist society was organized at Kill Buck some twenty years since, of which Henry S. SHORTER was a leading member for several years. Rev. J.R. ALEXANDER was the pastor for some time and left in 1866. About 1872, a small but neat church edifice was built by the united efforts of persons who were desirous of having a suitable house of public worship in town. The Rev. Walter GORDON devoted considerable time and took a deep interest in the building of the church. Meetings continue to be held by preachers of various denominations. A Sunday school organization has been kept up for several years. E.D. BULLARD is the present superintendent. It now numbers about 35 scholars and teachers. There was a Catholic church edifice erected in 1872, on the west side of the creek at Kill Buck. It will seat 400 persons and cost about $1,300. The society numbers 200, and is under the charge of the Salamanca parish. There are a few of this persuasion in this town, and services are held by them a part of the time in the Methodist church at Kill Buck. There are several cemeteries in town. One, near Kill Buck, has several monuments and marble tombstones, and is enclosed with a good fence. There is one near Peth, which was a burial place at an early period. This was near the old school house, and at the junction of the roads leading to Ellicottville and Chapellsburg. Of late, this has been superseded by a burial lot near the late Judge Francis GREEN's resident. It is an elevated and very suitable plat of ground for the purpose. There is a cemetery near the Plank Road House, on the west side of the creek, and another on the Sugartown, near the Free Will Baptist Church. This is near the town line of Humphrey, but the cemetery is in the town of Great Valley. Another cemetery, which has long been used as a burial place for the dead is located on Lot 19, in what is known as the Willoughby neighborhood. The foregoing comprise the Protestant burial places in town. There is a Catholic Cemetery at Kill Buck on the west side of the creek, adjacent to the Roman Catholic church, which was built in 1872. An association known as the Great Valley Cemetery Association was formed on September 2, 1871, with the following trustees, viz. : Alexander KEUHL, Peter M. FOLTS, William CROSS, William TOMES, Samuel KILBURN, and Robert PATTERSON. While it may be said of this town that the soil in the valleys is good, and mostly well adapted to raising grain and grass, still a large portion of the rough hill lands are yet covered mostly by the primitive forest, and are not of good quality for agricultural purposes nor favorable to dairying. When added to this is the fact that about 2,000 acres, embracing some of the best land in town is comprised in the Indian Reservation, which is mostly uncultivated, it is no wonder farming, generally, and the dairying business, in particular, is not as flourishing in Great Valley, considering its extent of territory, as in some other towns of the county. There are now in operation, in town three cheese factories. The first one was erected in 1858 on Lot 11 near the Willoughby school house by an association of patrons. The building is 30 by 60 feet, and two stories high, and receives the milk of about 200 cows during the season of making cheese. One, near the Rochester and State Line Depot, has the milk of 200 to 300 cows, with an average of about 4,500 pounds of milk per day. It was built, in 1872, by the patrons and has been run by I.N. SHELDON of Cuba, until 1878 when it was bought by Mr. FOX of Ashford. For the month beginning August 16, 1878, 200 cheeses, weight 55 pounds each, or 11,000 pounds for the month, were made. Sold in September 1878 at 83/4 cents. Mr. FOX also owns the Summerville Hollow Factory, two miles below Ellicottville, which is of about the same capacity as the one last named. The buildings are each about 32 by 60 feet and two stories high. The milk of about 800 cows is consumed by those three factories. There is a remarkable well on the farm of Mr. FLINT, on Lot 11 which has been called the "breathing well." Some forty years ago, Mr. FLINT dug a well to the depth of 25 feet but failed to find water. He, however, stoned it up hoping that water might come. Afterwards, noticing a current of air proceeding from the well, he inserted a pump log, and enclosed it leaving the opening in the log uncovered. A current of air is continually blowing either into or out of the well, and a whistle placed at the end of the log has been heard half a mile. The current of air is sometimes steady in one direction for a whole day, and sometimes it changes every hour. Just before a storm, it is said to eject air. The well has been visited by many scientific men but no satisfactory explanation of th phenomenon has yet been given. About the year 1808, there was a most terrific hurricane, which passed over the south part of the town of Great Valley, with awful force and fury, prostrating the heavy forest trees like grass before the seythe. The course of the terrific storm was from west to east, and was about half a mile in width and extended probably from somewhere about Warren County, PA., where it began to the vicinity of Dutch Hill. It made most horrible havoc, sweeping the trees into a mass of fallen timber and brush, resembling an old-fashioned "slashing," only that the roots of the trees were, in many cases, upturned. From this windfall a small stream which empties into the river, half a mile below Carrolton Station, is called "Windfall Creek." ROBERT PATTERSON was born December 3, 1800, in Centre Township, Butler County, PA. He was the fourth in the family of eleven children of David G. and Sarah (THOMPSON) PATTERSON, four of whom are now living beside Robert, namely: Sarah, Joseph, Thomas, and George W. His father was a native of Cumberland County, PA., and his grandfather emigrated from Scotland at an early day and settled in Cumberland County. He was a soldier in the Revolutionary War, and was killed in the army. David G., the father of the subject of this sketch, died in 1847 in Butler County, PA. Robert PATTERSON passed his youth on his father's farm in Pennsylvania and in the common schools of that county until he was twenty-five years of age. In May, 1827, he removed to Cattaraugus County and settled in Great Valley, where he engaged in the lumber business; continuing in this avocation till 1861, when he went into the hotel business, in connection with farming. In this, he continued for thirteen years, when he sold his hotel, and has ever since been engaged in farming in Great Valley. In 1840, October 14th, he was married to Charlotte, daughter of Nathan and Mary HOWE of Great Valley. The result of this union was five children, namely: Daniel H., William, Mary, John H., and Otis H., of whom two are now living, Daniel H., and Otis H., the oldest and youngest. 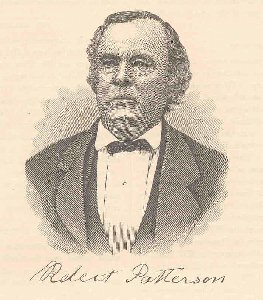 Mr. PATTERSON commenced life empty-handed and is now considered one of the successful farmers and business men of Great Valley. Never was an office-seeker, but has held most of the town offices. Originally a Whig, he cast his first vote for Henry CLAY. Since the formation of the Republican party, he has been a consistent member of the same. In religious sentiment, a Presbyterian. Mr. PATTERSON is a remarkably well-preserved man for his age. JOHN GREEN was born May 31, 1799 in Lyons, Wayne County, N.Y. He removed to Cattaraugus County with his father's family and settled in Olean when he was about ten years of age. His father, James GREEN, engaged in the lumber business there, erecting the first sawmill in the town of Olean. After remaining in Olean about five years, he sold out and removed to Little Valley, and there built the first sawmill. After remaining there about five years, he sold out and came to Great Valley and built the first saw and grist mill in that town, where he lived for fifteen years; he then sold and removed to Illinois, where he resided till his death, which occurred in 1854. John remained with his father till the latter moved West. His education was limited to the common schools of Cattaraugus County. After his father left, John learned the millwright and carpenter's trade, and there followed his trade in connection with the lumbering business until about 1855 when he retired from business. On September 4, 1828, he was married to Lucy, daughter of Nathan and Mary HOWE of Great Valley. No children. 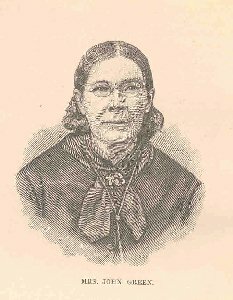 Mrs. GREEN was born August 16, 1807 in the town of Phelps, Ontario County, N.Y.
Mr. John GREEN was magistrate for four years, and commissioner of highways for several years, and was postmaster of Great Valley for nine years. Was always a staunch Democrat. In religious sentiment, both he and his wife were Universalists. He died September 4, 1874. His wife still survives him.